Single Sized Jeans | working my way there, one bite at a time. Woohoo! I love four-day weeks. On Saturday, we just needed to get out of town, so we went to Lancaster, PA for a day trip. We hit up our favorite smorgasbord, but honestly, we didn’t hurt ’em like we use to. My husband only ate one plate, and I only had a little extra beyond that. Plus dessert of course, but I didn’t even finish that. And that’s all we ate that day, so it didn’t hurt! There wasn’t a good way to track that, so I didn’t, but I don’t feel guilty considering that was lunch and dinner. Yesterday, I made DELICIOUS Cheesy Chicken and Stuffing from Emily Bites. Holy cow, this stuff is good. One of the best things I’ve made. Make it now. Like, right now. My husband even told me that he wanted this as his birthday dinner. I’m picking Cheesecake Factory for mine and he’s picking this. That’s saying something! 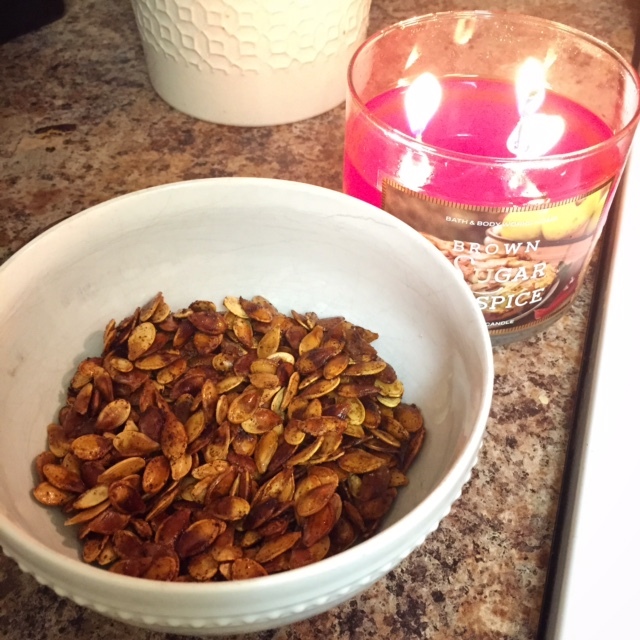 Since I made my Morrocan Slow-Cooker Stew this week with pumpkin, I took the pumpkin seeds and asked my husband, “Hey, do you like pumpkin seeds?” He responded with, “Yeah, roasted with salt.” So I decided to make them with cinnamon sugar because it’s my kitchen and he’ll eat it anyway. It’s really simple to make, which is great. The most time intensive part is picking them out and rinsing them off. 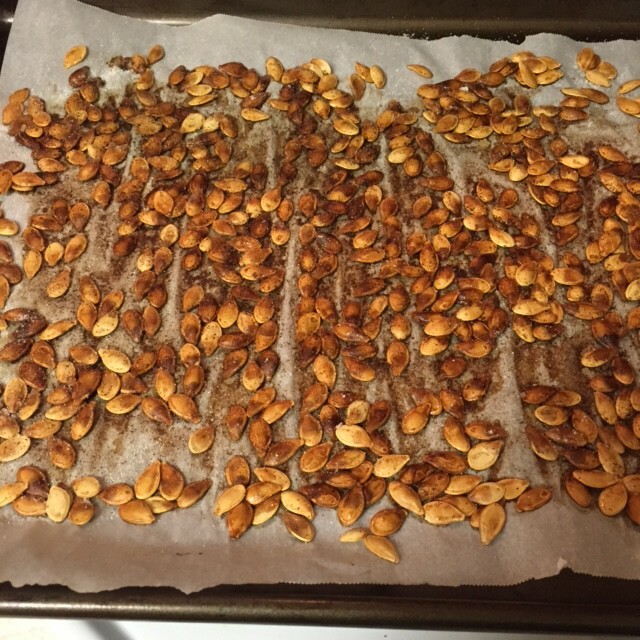 Once you do that, you just mix them in a bowl, put them on a tray, and spread them out into one layer. After you’ve done that, roast them at 300 degrees for 40 minutes and voila! Dessert. Melt butter in the microwave for 20 seconds. Melt 10 seconds at a time as needed until fully liquefied. 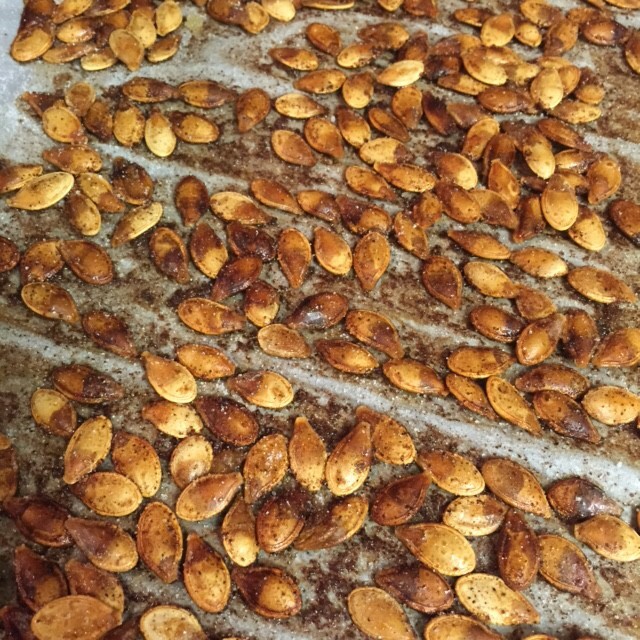 Mix with pumpkin seeds and cinnamon. 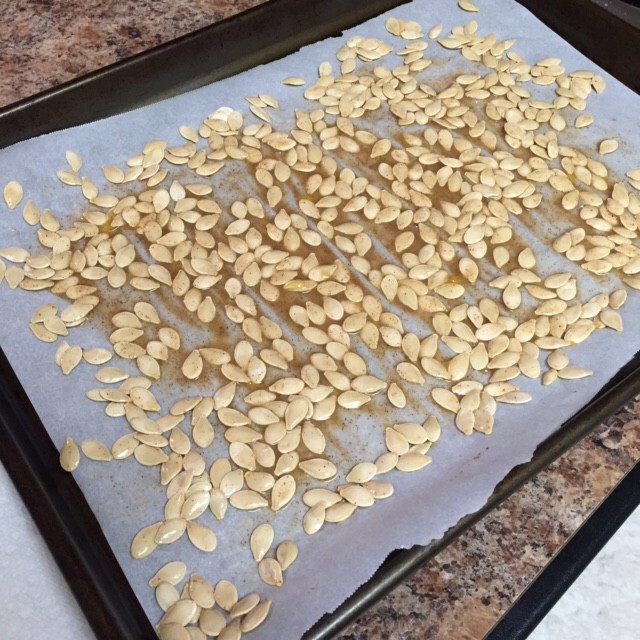 Put wax paper on a baking sheet; pour seed mixture on the paper and spread into one layer. One done, pour into a bowl. 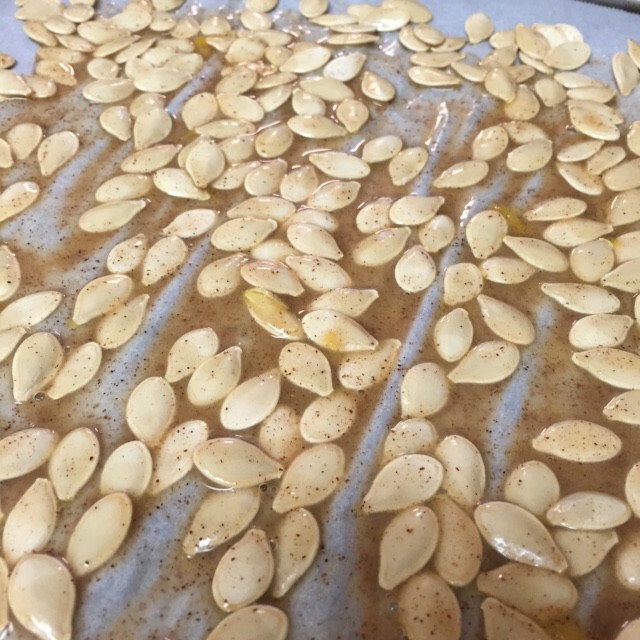 Sprinkle sugar over them to taste. These are fairly calorie-laden, so enjoy with caution. It’s hard to stop once you try them! Definitely not a snack for a weight watcher, but hey, we all have our temptations. 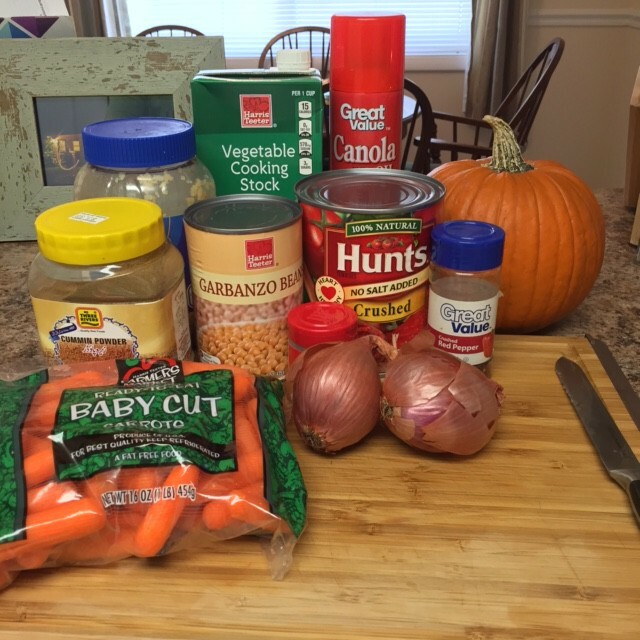 This is a great recipe for fall and winter. 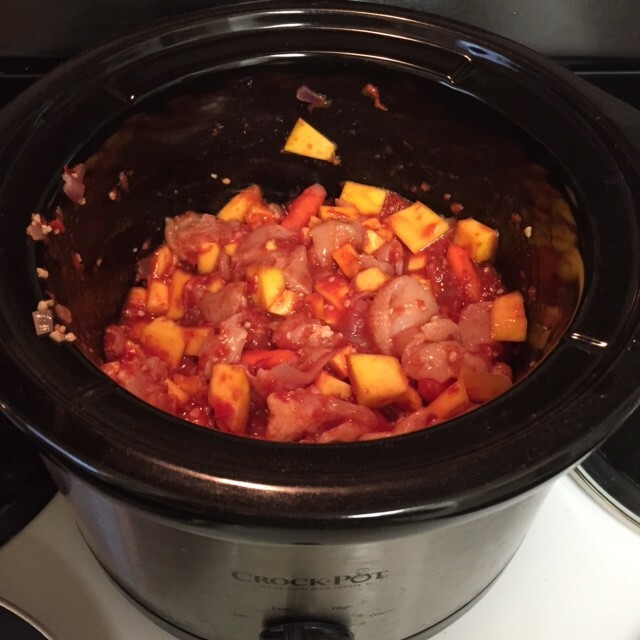 I substituted pumpkin for the squash, and it was great. HOWEVER, the spice amounts that they have listed here are ridiculously low. I got this off of the Weight Watchers site, and was really surprised at this. I really like spices, so I shook my heart out, and even then this came out pretty bland. So my encouragement to you is to go crazy with the spice in order to make it taste like what it smells like. This smells amazing, btw. Your house will thank you. Coat a small skillet with cooking spray. Add onion and garlic; saute for 5 minutes. Add chickpeas and salt. Stir, cover, and heat for an additional 5 minutes (I say longer – the chickpeas were pretty hard). Note: I’m a meat eater. I like it. A lot. So I added a cubed pound of boneless skinless chicken breast to this, which bumps up each serving to about 7 pp. Still not bad and very filling. If you serve it over 2/3 cup of rice, you’re looking at 11pp total. Let’s just be real. Sometimes we eat out of Tupperware. It’s not reeeeeally Weigh-in Monday, since I switched to Friday last week, but I didn’t blog on Friday, so I’ll double-tap this week and get on my new schedule this Friday. When I weighed myself this morning, I found out that I’ve lost 2.5 pounds since last Monday. That’s during the week that I went to Cheesecake Factory, Mexican food, and a brunch buffet. What the what? That’s a total of 12.5 pounds in six weeks! CHEESECAKE FACTORY EVERY DAY should be my new mantra! Over the weekend, I had my delicious parfait again (thanks Hungry Girl! ), which I will again be having tonight as dessert because I have a lot of points at the end of the day. I’ve had this with both strawberries and apples, and both are great. I’m going to try it with cherries next. We also made Cheeseburger Tostadas, which I’ve posted the recipe for, again, thanks to Hungry Girl. Tonight, we’re going to be trying an awesome (smelling, at least!) 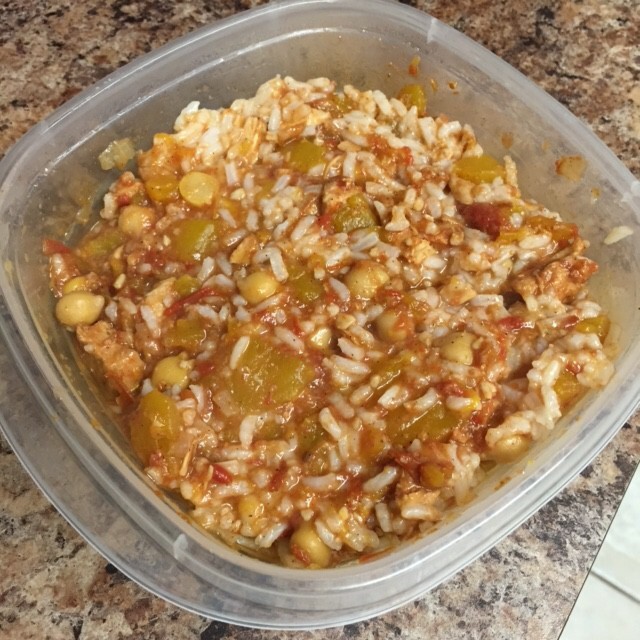 Moroccan Slow-Cooker Stew over brown rice. I’ll let you know how that goes and will post the recipe tomorrow. 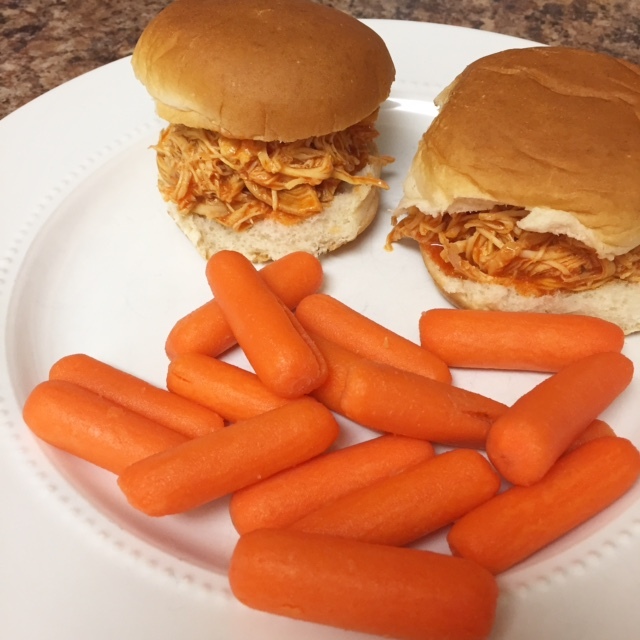 I love that there are so many wonderful and diverse Weight Watchers recipes out there! We haven’t gotten bored at all – besides leftovers, we haven’t made the same recipe twice! How is everyone else doing? Any recipes I should try next week?